1st Assignment = "Elevator Speech"
1. Work on the 1st Assignment "Elevator Speech" (1-2 mins). You may be asked to present as early as next week! 2. 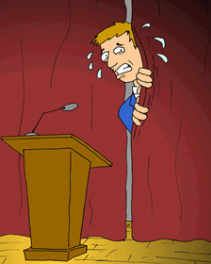 Watch the videos below to learn how to reduce the fears of public speaking. 4. Bring at least one Table Topics question based on the weekly theme.